In November I qualify for a free bus pass and, Insha'Allah, a pension, so here is how we will be celebrating. Dedicated Savall and Sufi watchers will also be interested in another concert in Paris, which will form a yet-to-be-announced Alia Vox combined CD and book release. Blogging will be at a reduced rate for a fair while as I will be in retreat, but not defeated, after Paris. 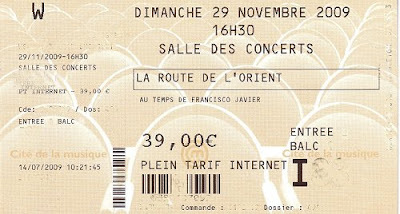 Now take La Route de l'Orient. Thanks for the heads up Malcolm. The Miles exhibition was going to be next weekend's post. But you got there first!